Any fans of this magnificent underrated opera? While I admire it's score endlessly and this easily qualifies as one of my favorite French operas, there are some problems with the libretto. The biggest problem is probably the main character himself. He is absolutely insufferable, not sure if whether or not this is intentional, though. Ever thought Heinrich from Tannhäuser was a loser who deserved Elizabeth far less than noble Wolfram? Well, meet Cellini here, one of the biggest douches I have ever met in the history of opera. He makes Heinrich look likable. Nevertheless, libretto has it's merits and music is devastatingly beautiful. "Si la terre" is playing in my head right now. Love it, but then again I love anything Berliozian. Still, it is far more stageworthy than Beatrice et Benedict. The Met did Cellini in New York many years ago, most likely during the centennial year 2003, and there was also an ENO version broadcast worldwide directed by Terry Gilliam. 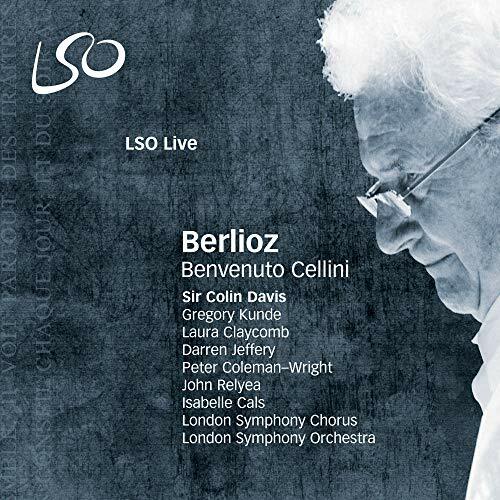 Berlioz perhaps admired Cellini as an archetype of the heroic artist risking all and triumphing at the end to produce the almost-impossible masterpiece. The final scene with the statue of Perseus emerging in pure gold was stunning in both stagings I saw, though perhaps more in the Met version. And the music is fantastic, especially when the Roman Carnival is set in context. it is not very interesting of me to remark that I still need to spend time with this one. I congratulate you two fans, I have just never been able to crack the piece. There are some elements I enjoy, but I have been bored stiff and the creation of the statue scene just does not work for me. I love most of Berlioz' output, but this one mystifies me. In real life, Cellini had a life full of event and adventure and his autogiography certainly makes him seem an engaging rouge; if half of it can be believed. His life story is well worth a read, he was a real Rennaisance man in the sens of being so multi skilled. Nevertheless, libretto has it's merits and music is devastatingly beautiful. The libretto will do for me. Not to sound off as overly cynical, but as librettos go, well, it's a libretto. It'll do to hang the music on. As far as the music, I agree with what you say, "devastatingly beautiful". Aching in places, jaunty in others. Full of the mysteriousness that makes Berlioz's music so attractive and alluring. I'm a big fan of the scoring, too. The music is wonderfully colored, owing to what sounds to me like a keen use of the woodwinds. Gives the music an extra patina. I congratulate you two fans, I have just never been able to crack the piece. There are some elements I enjoy, but I have been bored stiff and the creation of the statue scene just does not work for me. Same here. But I think I might have been put off this opera for life by a semi-professional production that I saw several years ago. An evening of profound tedium, relieved only by the comedy of the statue-casting scene. They really had bitten off more than they could chew - having experimented with a spray-painted body-builder in the role of the statue, they finally opted for a huge cardboard cutout of Perseus, which proceeded to wilt as the scene went on. It ended up leaning at an angle of thirty degrees from the vertical. Great stuff. Yes, that would colour way you hear it. I have one or two unfortunate equivalent experiences and I see them when I hear the music. One word: compartmentalize, compartmentalize, compartmentalize. Block out the bad and let your ears be your guide. Musically this is prime Berlioz. Don't let it go to waste. "I had been greatly struck by certain episodes in the life of Benvenuto Cellini. I had the misfortune to believe they would make an interesting and dramatic subject for an opera..."
Anyone for "let bygones be bygones"? Well generally he had such a hard time with his stage works. I can imagine his exasperations. This is the only of his major works I have any trouble absorbing. I think I will try it a scene at a time, repeatedly. And perhaps things will fall into place for me. I used to do this with some Wagner when I was a teen to try and get to grips with it, it worked then, it will probably work now. I just have less application now. Berlioz autobiography/diaries are a great read. He is a superb writer and very witty. I might get hold of the volumes again. I absolutely love Benvenuto Cellini, though I've never seen it staged. I have the Gedda/Davis recording, and heard him conduct it in concert with the LSO some years ago. I love its swagger, its energy and vitality. There are moments of pure joy, and its such a contrast to gis magnum opus, Les Troyens (quite possibly my favourite opera of all time). I guess I'm just a Berlioz nut. I pretty much love everything he wrote. Which is cheap enough to be a must buy at current Amazon MP pricing. I have it, but must admit to being underwhelmed by it. But I am not sure if I should blame composer or conductor. No it was an earlier concert in 1999. Giusppe Sabbatini was the Cellini and Elizabeth Futral Teresa. It was an absolutely thrilling evening and garnered ecstatic reviews. Sabbatini was als supposed to sing the role in 2007 when the LSO Live version was recorded, but had to withdraw and was replaced by Gregory Kunde.